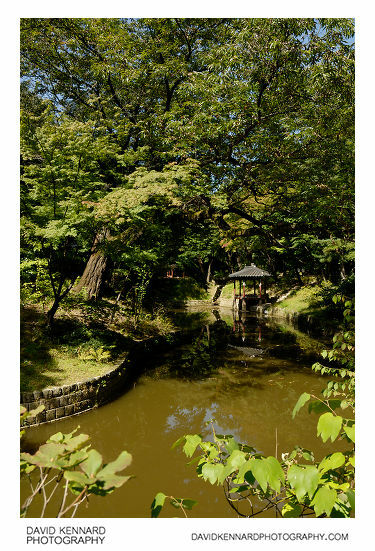 Carrying on further north is Bandoji (Hangeul: 반도지; Hanja: 半島池), which means 'Peninsula Pond'. Originally there were siz rectangular and circular ponds here, but they were transformed into a large singular pond during the Japanese occupation. Round the pond are located various pavilions in different shapes. This one on the water's edge is fan shaped, and is called Gwanramjeong or Gwallamjeong (Hangeul: 관람정; Hanja: 觀纜亭). After walking past the pond we carried on up the path and came to this pavilion that stands in an area by itself. 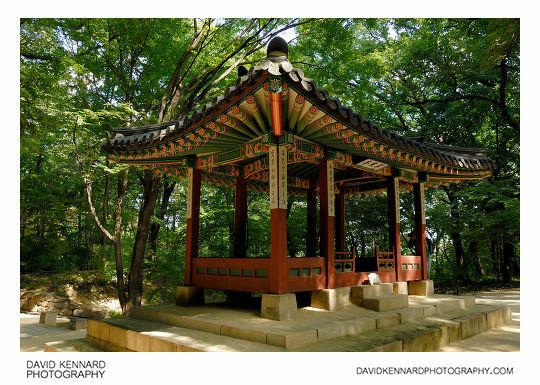 The pavilion's name is Chwigyujeong (Hangeul: 취규정; Hanja: 聚奎亭). For this photo I think it would have been better if I'd been standing a bit further back (to avoid cutting off the bottom) and made sure it was straight. Maybe a lower angle might have worked better as well. Oh, and there was lots of lens flare I had to clone out, so ensuring there was no lens flare at time of capture would have been a good idea too. At the north end of the garden we come to the Ongnyucheon area. The first building you come to is Chwihanjeong (Hangeul: 취한정; Hanja: 翠寒亭). I imagine that the small pavilions in the secret garden would only have been used during the summer as with no walls they would be a bit cold during the winter. 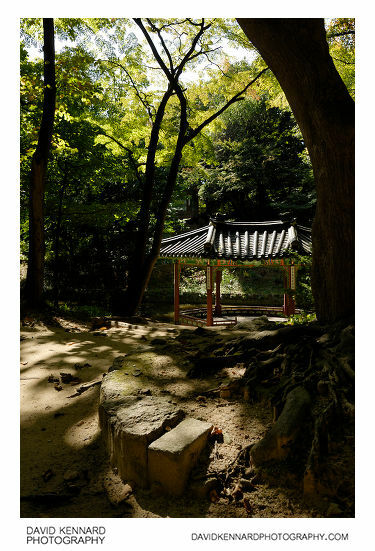 The above photo is another view of Chwihanjeong. To the north of Chwihanjeong is this building, Nongsanjeong (Hangeul: 농산정; Hanja: 籠山亭). 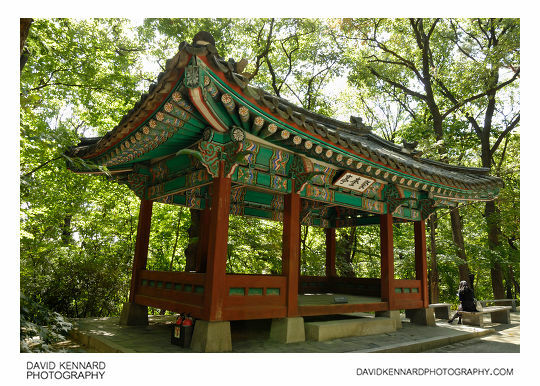 The rear garden of Changdeokgung would really be at its best in autumn (I was there late summer). 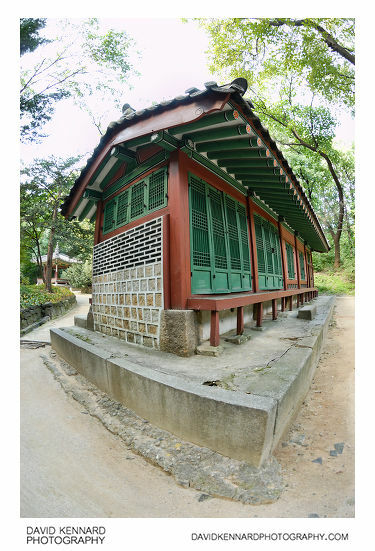 You can view a 360 tour of Changdeokgung that was taken in autumn on Daum maps (similar to Google Streetview). 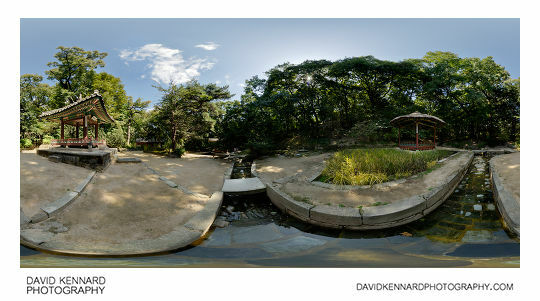 I took a 360 panorama over Ongnyucheon (Hangeul: 옥류천; Hanja: 玉流川), a stream that runs through this area. 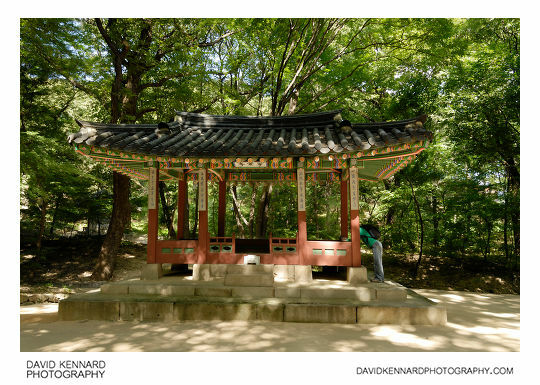 You can view the 360 version here: Changdeokgung palace – Ongnyucheon area 360 VR. The king would sometimes hold parties in this area where a wine cup would be floated down the stream, and then the recipient would have to drink the wine and compose a poem on the spot. This tradition was copied from China, where it was first started by the famous caligrapher Wang Xizhi in AD 353. 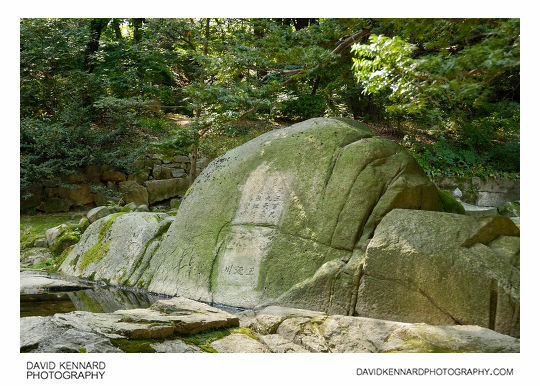 Also in this area is Soyoam (Hangeul: 소요암; Hanja: 逍遙巖), a rock with the name of Ongnyu stream carved into it by King Injo (reigned 1623-1649). Also carved into the rock is a poem composed by King Sukjong (reigned 1675-1720).